The official name of the church is the Church of Saint John of Matha and Saint Felix of Valois. 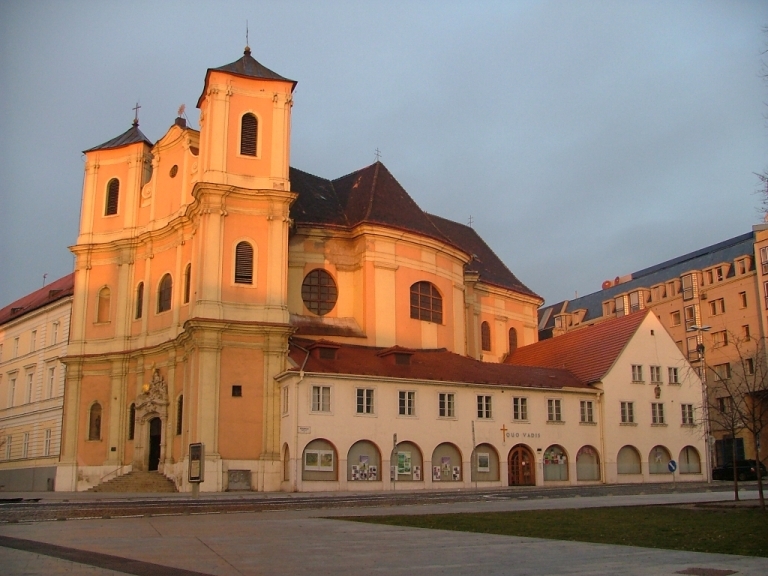 However, due to its association with the monastic Trinitarian Order, it has bcome more commonly known as the “Holy Trinity Church.“ It is a Baroque-style Catholic church near Bratislava’s Old Town. The church was built on the site of the older church of St. Michael, which along with the settlement of St. Michael was demolished in 1529 during the Ottoman wars so as to better see the attacking Ottoman Turks. The Trinitarian Order started construction of the present church in 1717 and it was consecrated in 1727. At the same time, a Trinitarian monastery was also built on the site. Unfortunately, the Trinitarian Order was closed by Emperor Joseph II in 1782 in his “storm against the monasteries“ (Klostersturm) and the county office took possession of the building. However, it did not suit its needs and the monastery portion was almost completely demolished. 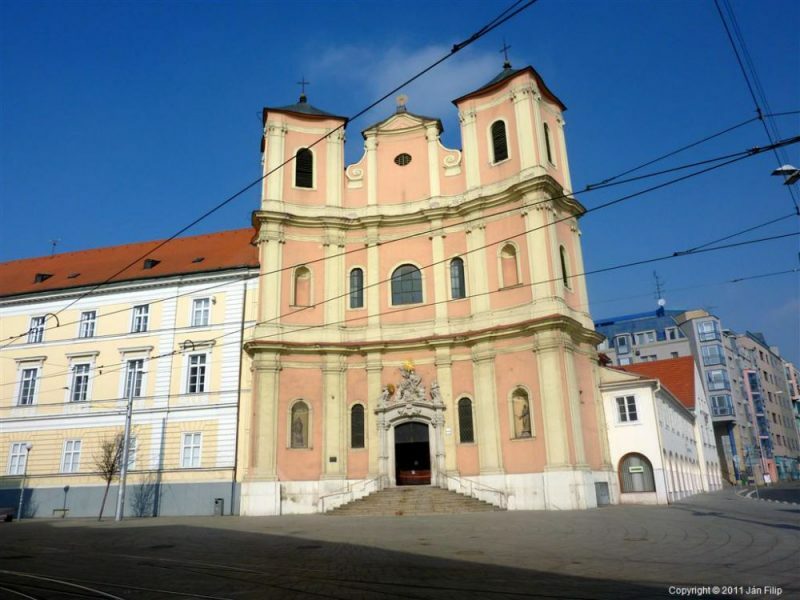 Today the church is simply a parish church of the Catholic archdiocese of Bratislava. The design of the church reflects the new thinking of the 18th century concerning the function and form of Baroque churches emphasizing space and light. The design is thought to be influenced by St. Peter’s Church in Vienna, with the archetect of St. Peters possibly having a hand in the blueprint. Outside, the main portal is richly decorated in Rococo style, celebrating the Holy Trinity. Inside, the arch of the church is dominated by a cupola with “trompe-l’œil“ (3D) frescos by the Italian Baroque painter Antonio Galli da Bibiena, 1744. 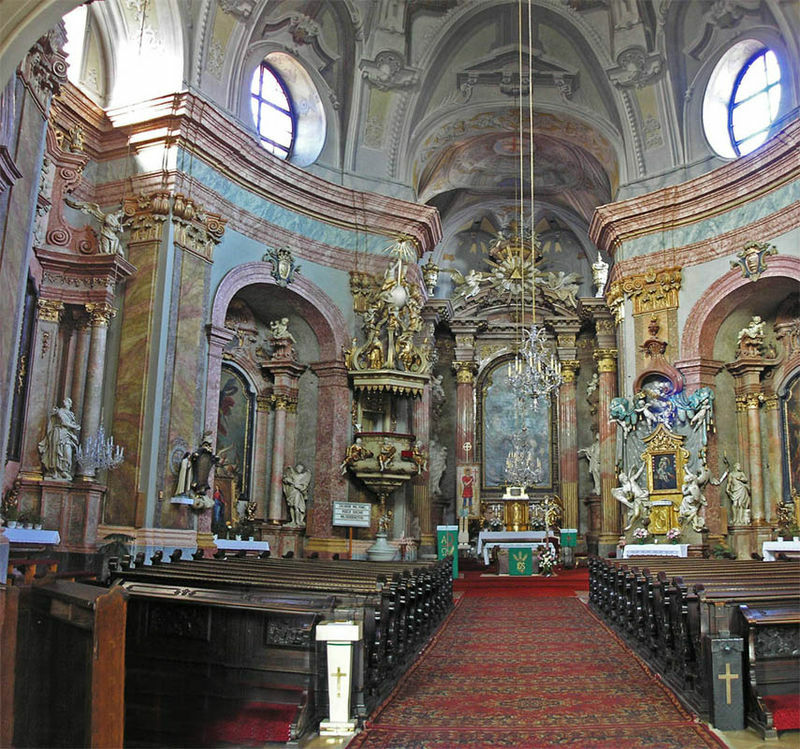 The church consists of a mssive main altar and several side altars. Look upwards at the inner cupola and you will still see a blue and red cross, the symbol of the Trinitarian Order. The main work of art is the large altar painting depicting St. John of Matha and St. Felix of Valois – the two founders of the Trinitarian Order – ransoming Christian prisoners from capture, painted by Franz Xaver Palkó in 1745. It is a masterpiece. Interestingly, the artist painted himself into the picture. He is the boy on the far right hand side! Please take time to look around our beautiful church and pause and say a prayer. In extraordinary cases, the parish reserves the right not to provide this service.